I loathe car stickers. You know the ones: the shining stick figure families on the backs of suburban minivans, with the mom and dad and kids and cat and dog and sometimes even the nanny. They are totally not my thing. Our thing, for that matter, because hubby hates them too. 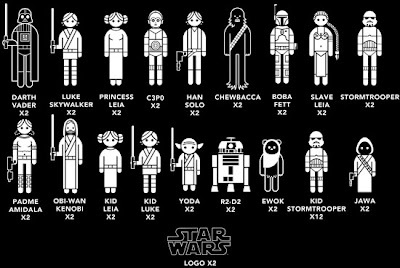 So when I came across this Star Wars version, I giggled and thought: cute. But, no thanks. And then I took a closer look and realized something: these are actually totally twisted! Sure, ThinkGeek has provided some more traditional options but if you wanted to, you could totally mess with people: say, with a combo such as Chewie, Yoda and R2D2... who would each represent? And what's the Jawa? Your dog? Hmm... these are way kewler than I originally thought... What combination would you choose?